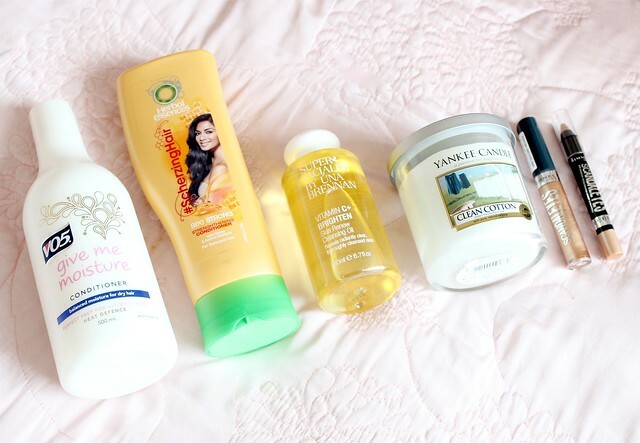 I was planning on posting another '2013 favourites' post today (I've still got my favourite hair, skin and body care products to share with you all) but I don't want to bore you with too many of those posts all at once so I thought I'd break things up a bit with a little haul and I'll be back with the faves over the weekend. So, this is what happens when I need to buy some new conditioner from Boots. I end up buying more things that I didn't really need but couldn't resist. Brilliant willpower there Kayleigh - well done on spending unneccessary money yet again. As I said, I needed some more conditioner and as I have long, thick hair and go through conditioner like there's no tomorrow, I decided to buy a couple of large bottles in the hope they'd last me for longer than a week. I bought V05 'Give Me Moisture' conditioner which is a repurchase for me as its one of the only conditioners that actually detangles my knotty mane. Actually, while I'm on this topic, do any of you know of any miracles for detangling hair? My hair is like a ball of tangles after I've washed it and I'm desperate to find something that will prevent me having to sit detangling my hair for a good 30 minutes after getting out of the shower. As well as V05, I also picked up the Herbal Esssences 'Bee Strong' conditioner as I've heard good thing about it and its also promoted by Nicole Scherzinger who has 'Schamazing' hair and is a good advert for the brand. I'm an advertisers dream I swear - stick a celebrity on the bottle and I'm all over it. I also decided to try the Una Brennan Vitamin C+ Brighten Cleansing Oil (currently on sale at Boots) as cleansing oils are my preffered method of cleansing and I've heard good things about the Una Brennan range. The only thing I'm not impressed with is the packaging (no pump) so I'm hoping I can figure out a way to use it without it spilling everywhere. If any of you know of a pump I can buy that will fit on this bottle, let me know. My favourite purchase of the bunch and one that I'm so excited about is the Yankee candle as its the first one I've ever bought! Every time I go shopping, I always spend a good chunk of my day sniffing all the Yankee candles in WHsmith (I know, weirdo!) and although I'm not keen on spending a lot of money on candles, I had a bit of Christmas money to spend so thought, why not? I went for the scent 'Clean Cotton' which is definitely the best one I've smelt yet as it smells exactly like you'd image, clean and fresh. I love the smell of fresh laundry so I've been loving burning this for the past few nights in my living room - there's nothing better than a fresh scent filling the room! The size I bought is one of the regular tumblers as I couldn't jusity spending £19.00 on one of the large jars - even though I was tempted! Finally, I picked up two products that I've wanted to try for a long time from the Rimmel 'Scandal Eyes' range. I bought one of the Shadow Paints in the shade 'Golden Bronze' which is a liquid metallic eyeshadow (I'm very intrigued by this one) and one of the Shadow Sticks in the shade 'Bulletproof Beige' which I thouht would be nice to use in the innter corners of my eye and under my brow bone. They're both products that are unlike anything else in my collection and I've heard good things about them both from other bloggers. However, its just my luck that when I got home from Boots and after taking these photos, I realised that the shadow stick was actually snapped when I bought it so when I came to do a swatch, the top of the crayon fell clean off. I'm hoping I'll be able to sharpen it so I can still use it but seriously, how annoying is that? Boo! So there we have it - some of my most recent beauty purchases! I've also picked up a few things from MAC, a new hairbrush and the famous Ben Nye Banana powder so keep your eyes peeled for reviews of all of these things! If there's anything inparticular here that you'd like to know more about, let me know in the comments below. Have you bought anything from Boots recently? Have you tried any of these products? Love that Yankee Candle scent! the same thing happened to me with a shadow stick - annoying isn't it?! Oo i have to say I love the Bee Strong conditioner! & the vo5 one is also one of the only conditioners that helps untangle my hair after a shower too! I have horrifically knotty hair, Dove Nourishing Oil Care Leave In Conditioner (yellow bottle) helps my brush glide through. I love the look of these eyeliners! Rimmel is my favourite drug store brand. Must try these! 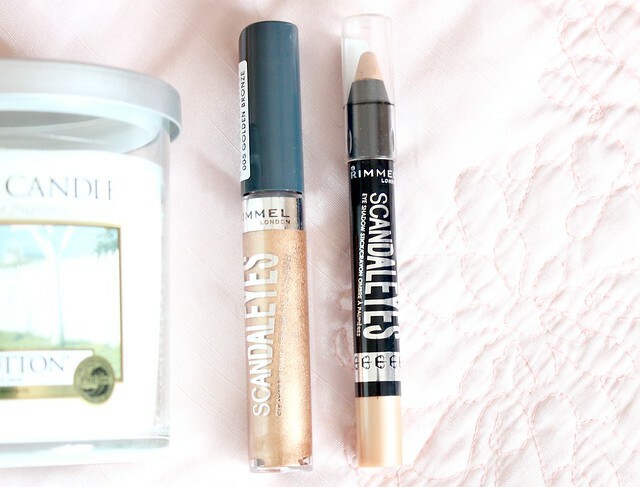 I haven't tried any of these products before but I love the look of Rimmel Scandaleyes Bulletproof Beige. Those Rimmel products look gorgeous and that Yankee Candle sounds gorgeous! I'm intrigued about the cleansing oil! Can't wait to read a review on it :) The candle sounds lovely too! Great buys! I have been stocking up on yankee candles as they are half price at my local garden centre, I agree clean cotton smells gorgeous. Clean Cotton is my favourite candle scent ever! Love that candle! The Scandal Eyes Range looks sooo gorgeous, especially the shadow sticks. Sadly, Rimmel isn't sold in Germany any longer. Really want to try the scandal eyes range! That shadow stick colour is gorgeous!! I adore clean cotton! It is one of the prettiest Yankee Candles by far!! I find using Argan Oil or the Macadamia leave-in conditioner works for detangling my hair really quickly when it's wet. Mmmmm, that Yankee candle was a great purchase, i can't get enough of them! One of the things that helps me detangle my hair is the L'Oreal Kids (I know!) detangler spray, a few sprays and my hair hasn't a knot in it, and I have serious knots, my hair has broke a brush before! I'm curious about Una Brenna cleanser too! Have you ever tried Aussie Hair Insurance spray for detangling? It was a lifesaver when I had extensions in, it detangles really well! I love that vo5 conditioner. I use it for my weave it and it makes such a great difference! Definitely going to need to pop into Boots - I want to try that cleansing oil, especially if it's on offer!! I use moroccan argan oil in my hair to detangle my hair. I use a little bit of it right after i come out of the shower and it not only detangles but also leaves my hair shiny, smooth, and soft!! Everyones gone crazy over the Yankee Clean Cotton candle. I'm not sure. I like richer sweeter fragrances. Tk Maxx do some great candles! I loveeee the Copenhagen candles if you can find any! I have wanted to try that cleansing oil for ages now, might just pop into boots now it's on sale. I would love to try the shadow paints. It looks like a very unique drugstore product. I also love the clean cotton yankee candle! I would love to try the shadow paints. It looks like a very unique drugstore product. It gets really tangled! one thing that really helps to get the tangles out is the brush i use-the wet brush. I'm loving the Bee Strong shampoo and conditioner at the moment, great haul! The whole Bee Strong range is just amazing... from smell to affordability to how much it improves my hair. As for the Shadow Sticks, I do like them if they're not broken (I'm sure I picked mine up from Poundland?! ), but it is annoying that they are so big as it took me a while to hunt down a sharpener big enough! Lovely items and the makeup looks like fun and pretty shades. Using a very wide toothed comb or your fingers to get rid of knots in the shower while your conditioner is still on helps. The L'Oreal Elvive Extraordinary Hair Oil is great too. Ohh I cannot wait to hear your thoughts on the Cleansing Oil, I've been meaning to try it for ages! 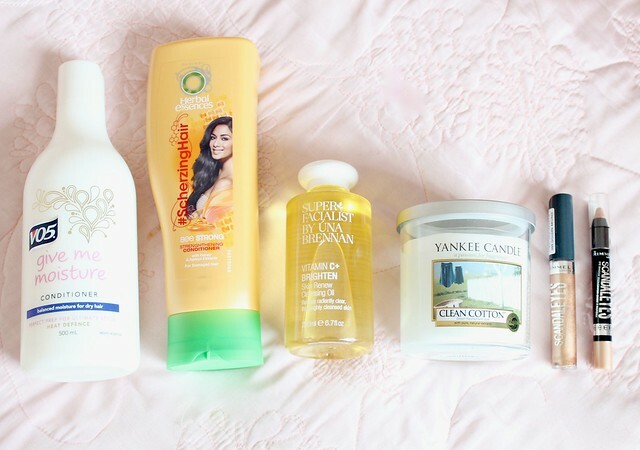 I absolutely love using cleansing oils and I'm always on a hunt for new ones. Boots sell Yankee candles?!? And Clean Cotton - best scent in the world! Those Rimmel products look beautiful! 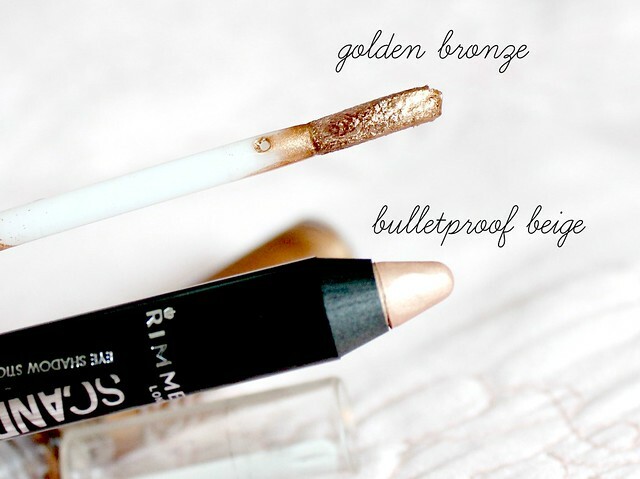 Golden Brozne and Bullet Proof Beige would be gorgeous for a dressy look! I do really like the Una Brennan cleansing oil, it's a great high street cleanser but I'm not that keen on the scent! Great purchases, the Clean cotton Yankee candle is gorgeous, I'm addicted to buying these especially the sweet cake smelling ones. My hair also gets tangled when I wash it as well so before I shower I brush it out and then I use a wide-tooth comb before I shampoo & condition as well as after, it helps.